I find myself thinking about liberty on this long weekend between the summer months of July and August (the sweet spot of summer). I find myself grateful to live in a country where I am free to worship in manner of my choosing, to speak freely without fear, to question those in power, and to consume chemicals which alter my brain chemistry. This weekend, my poison of choice is the pride of Ireland: Guinness. How wonderful it is for adults to make the decision to enjoy this imported drug. It tastes good too! I find myself also thinking about Marc Emery who was arrested on Friday by the RCMP at the request of the US DEA and how this appears incongruent (at least to me) for countries such as Canada and the United States to do this when they supposedly love “liberty”. Facing extradition to the United States, Marc faces three charges: conspiracy to manufacture marijuana, conspiracy to distribute marijuana seeds and conspiracy to engage in money laundering. These charges stem from Marc’s online marijuana seed company, which operated in B.C. with impunity for about ten years. The DEA is upset that about 75% of Marc’s online customers were American. I remember thinking, when I was younger, that stores that sold items promoting marijuana use (pot lighters, pot t-shirts) should face sanctions. After all, these stores, in my opinion, were promoting a lifestyle that is arguably detrimental to society. When I grew up, I realized that individual choice (of adults) in a truly free society trumps what any tyrannical child might impose otherwise. In the end, if we wanted to benefit society, the government would raise our children in state-run daycares, give us all government jobs, ban alcohol and caffeine, and would mandate daily exercise. But then in what kind of country would we live? It all sounds rather socialist to me. I admire the United States for the various struggles in which it has faced that ultimately forged the nation as a free country. “No taxation without representation”, “Live free or die” and “Life, liberty and the pursuit of happiness” are all inspiring mottos and any country that wishes freedom and liberty for its citizens would do well to live up to them. Our southern neighbour and ally is generally considered to be the freest country on the globe. However, their current push to extradite Marc Emery’s from Canada to face these charges challenges this notion of America’s paragon status of liberty. This DEA action also leaves me unsettled because at its root, it is quite political. The decriminalization of marijuana is a heated and current issue and it is no secret that America is watching this quite closely. Emery is arguably the most public advocate for “liberalization” (root: liberty) of marijuana laws and he’s the leader of the most active (and prominent) political party fighting for this issue (the BC Marijuana Party). The RCMP, at the request of the alien DEA, raided the HQ of the BCMP. This upsets me as an advocate for democracy and the free and open discussion of ideas without persecution. In America, the second amendment guarantees the right to bear arms. This amendment was born out of the colonists’ struggle for freedom ‘against tyranny’ from the British Empire. The fight for freedom begot freedom and now Americans have the right to buy and carry guns. Advocates and defenders of the second amendment will tell you “guns don’t kill people, people kill people”. Yes, killing people is abhorrent, but the right to the tools of self-defense is at the foundation of liberty. Gun manufacturers aren’t guilty when one of their products is used illegally (or when guns get into the hands of children). Equally, Marc Emery should not be guilty of “conspiracy to manufacture marijuana” for selling seeds. The selling of those seeds landed Marc the charge of “conspiracy to distribute marijuana seeds”. Like alcohol, marijuana is a soft drug and is relatively inert when enjoyed consensually by adults. Psilocybin (magic mushrooms) is illegal to cultivate, sell and consume in Canada and in the US . Unlike marijuana, this drug has hallucinogenic effects and is therefore “harder”. Here is a website of a company, based in San Antonio Texas, that sells Psilocybe spores with impunity. The company asks that you do not cultivate and grow the spores into mushrooms but rather use their product “for scientific research”. Marc is free of any Canadian criminal charge, yet this weekend he being detained in a correctional facility until he can face American charges in British Columbia. This acute alien challenge to a current Canadian political discussion has me unsettled as a defender of our sovereignty. As a Conservative, I consider it an affront to my liberty (and yours) for any government to feel that it is responsible for protecting me from me. The summer heat, the DEA, and this Guinness has gotten me quite agitated. Maybe I should have a smoke. I’ve posted the banner advertisement for Peter Jaworski’s Liberty Summer Seminar on Blogging Tories because a) I’m going b) you should too and c) sitting on lawn chairs with Marc Emery and Ezra Levant by the campfire is likely to be one of those unexpected and amusingly concordant moments in life. Also, a significant section of modern conservatism in Canada is defined by liberty and I consider many of my views to be in line with libertarian philosophy. While I’m not exactly a “Get off my land, government!” libertarian, I believe that the citizen-government relationship ought to be to the advantage of the individual, rather than the government. The government works at the pleasure of the people, while the inverse would be tragedy. When the government unreasonably interferes with the personal and professional lives of people, it has over-reached its function. Anyways, enough about the gub’ment! I’m signing up and you should too. Besides, the organizer Peter Jaworski is a fellow alum from Queen’s and we’re usually an honest and fun crew (Tim Murphy’s on a timeout). UPDATE: Marc’s been arrested and may not be able to speak about liberty again this year. I haven’t too much more to say about Carolyn Parrish’s recent remarks that hasn’t already been said today by many Blogging Tories. But I will leave you an image to remind everyone that it’s just a matter of time before Carolyn finds her home back in the Liberal caucus. Now you can customize Gooooogle’s website logo to make your own custom Google! I’ve gone ahead and made the ultimate scandal searcher! Note: This is meant to be a work in progress and will be linked from the Blogging Tories website when it reaches an appropriate length and level of detail. For now, please suggest additions/corrections in the comments section. Upon completion of this document, the comments section will be closed. 1. What is Blogging Tories? Blogging Tories is an online community of bloggers who are supportive of the Conservative Party of Canada. 2. Why would I want to join the Blogging Tories? Besides being part of the greatest online political community in Canada, the inclusion of your blog on the Blogging Tories blogroll will increase the number of politically-minded visitors to your website. The blogroll is also read by some of the top politicos in the country. 3. When was Blogging Tories founded? Blogging Tories was founded on December 28th, 2004. Blogging Tories has the distinction of being the original political blogroll in the Canadian blogosphere. 4. Who started this, who’s in charge here? Blogging Tories was started by Stephen Taylor and Craig Smith. 5. Is Blogging Tories affiliated with the Conservative Party of Canada? No. Blogging Tories is a private organization that does not speak for or represent the Conservative Party of Canada in any official capacity. Members of the blogroll, however, can be associated with the party at any level from member to MP to leader. However, the organization itself is not associated with the party and does not represent its views. 6. I am supportive of the Conservative Party, but am I permitted to criticize it in order to improve it? Or, may I dump on certain policies/MPs that I do not agree with? Of course. However, if you are against the CPC and wish for its dissolution or failure, we’d like to thank you for stopping by and would encourage you to make your political home somewhere else as we’d all be more comfortable. 7. I’m a Red Tory / Social Conservative / Libertarian / Progressive / Centrist / Pro-life / Pro-choice / Muslim / Atheist / Gay / Christian, can I join your fine organization? 8. Who is not welcome in Blogging Tories? We follow the standards of most online communities in that promoters of hatred, violence, and/or criminal or unethical activity are certainly not welcome in Blogging Tories. Also, trolls and other trouble-makers will not be tolerated. 9. But, now you’re being intolerant of my “extreme” views, aren’t you? Intolerance of intolerance is certainly tolerated by the administrators and members of the Blogging Tories community. Go be a twit somewhere else. 10. How can I get my posts to show up on the main Blogging Tories page? Email your RSS feed (non atom format) to Stephen. 11. My RSS feed is in the Atom format, can I still have my feed included? Blogs hosted on Blogger (blogspot) come with Atom feeds. To convert your feed, go to Feedburner and sign up for the SmartFeed service. Then email the feedburner feed to Stephen. 12. You still haven’t included my feed on the main page. What gives? There may be a few explanations for this. Perhaps the most common reason for non-inclusion (99% of the time) is that Stephen gets a lot of email everyday and your email might have gotten lost in the clutter. Please try again. Your non-inclusion in the aggregator may be also due to the quality of your blog. If you have horrible grammar and write often with many spelling mistakes, your blog won’t be included. Another reason for non-inclusion is that while half of your posts are cogent arguments for Conservatism, the other half of your posts are about your cat Fluffy. Finally, your feed might not be appropriate for the main page, meaning that you write mainly about topics that are generally outside the realm of Conservative Party politics and/or you write about topics and express opinions that would embarrass the Conservative Party and/or Craig or Stephen (blogs that are “off-message”). By analogy, a pro-NDP blogging group may accept a blog that compares George W. Bush to Adolph Hitler, but they wouldn’t include such a blog in the aggregator because that kind of talk would embarrass the NDP. 13. Do Stephen and Craig endorse the views and opinions expressed by individual members of the Blogging Tories? The views and opinions expressed on members blogs of the Blogging Tories are not necessarily endorsed by either Stephen or Craig. 14. I’ve updated my blog but my blog’s link is still in the same place on the blogroll. How do I get it to the top of the list? Ping the Blogging Tories blogroll by going to the Blogrolling ping form (bookmark this). Fill out the form and click “Ping”. This ping form works on the honour system; if you haven’t just updated your blog, do not ping the blogroll. Abusers of the ping form will be removed from the blogroll. 15. You guys don’t get paid for this right? What can we do to help out? No, neither Stephen nor Craig receive any monetary compensation for their work on Blogging Tories. But, they’ll gladly accept pints of beer if they’re ever in your neck of the woods. It’s true, 44 American and Canadian agencies have jurisdiction over the border that separates the two countries and it comes at quite a cost. The staggering bureaucracy adds significant cost to the billion dollars worth of goods that crosses the border each and every day. For example, the average price of a car has $800 of extra cost figured-in because of extra wait-times (up to 300% more processing time per truck-shipment since 2001). With one in four jobs in Canada directly or indirectly existing to service the auto industry, reducing costs while maximizing security at the border should be one of the top issues on the national Canadian agenda. The North American auto-industry is so integrated that the parts in the vehicle that you drive have likely crossed the border seven times during production. Perhaps the federal government should look into further integration and harmonization of certain agencies to allow more efficient communications and data transfer to facilitate the transfer of goods while maintaining tight security at our border. I think that we should start a pool on when doll-stompin’ Carolyn Parrish will be accepted back into the Liberal Party. 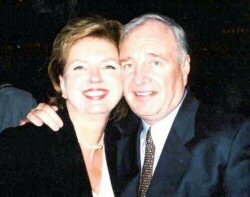 She needs the Liberal brand to get re-elected, yet Paul Martin doesn’t particularly need her as she still votes Liberal party-line anyways. Depending on the polls, Martin could need her Mississauga seat to maintain minority status. So, we could see Parrish back in caucus soon enough. However, the following comments do not particularly help her cause especially as the Liberal government tries to at least appear as if it is going to address terrorism. I don’t know about you, but I am particularly pleased that the General of our Canadian Armed Forces has the testicular fortitude to face terrorism head-on. Parrish can stomp on dolls for all I care, but when she stomps on our military for expressing their desire to fulfill their mandate, I imagine that I’m not alone among Canadians who would rather see Parrish relegated to the Parliamentary sandbox. Today I was tinkering with the Blogging Tories code and thought I’d try to make a WAP-enabled Blogging Tories website. What is WAP you might say? WAP stands for Wireless Application Protocol and it allows cellphones and PDAs to access online content. Most websites use the prefix wap to denote a wireless website (such as wap.tribute.ca for Canadian movie listings). Instead, I integrated some code that allows the end-user to merely type in “bloggingtories.ca” into their cell phone browser and the website will detect whether or not the browser is on a computer or on a cell phone. So, whether or not you’re using Firefox, Internet Explorer, or your internet enabled cellphone, point your browser to “http://bloggingtories.ca” and get the latest content from the Canadian conservative blogosphere! It’s still in “beta”, so let me know how it works for you in the comments. Developing: CNN and ITV are reporting that tube lines are closed in london after 3 similar and simultaneous incidents. Update: A bus has been evacuated. Update: Doesn’t seem to be as bad as 7/7. One casualty reported. Three devices detonated by bomb squad. Update: London has taken their online traffic cams down. The cams are “unavailable for operational reasons”. Update 9:29am: Tony Blair to address at 10am. 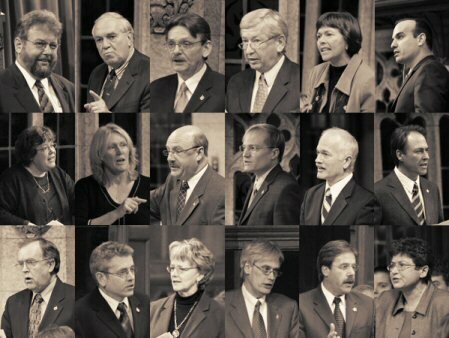 The NDP currently has 19 MPs in their caucus, 18 of which are older than 40. This is NDP MP Brian Masse and he’s 37. Contrast the NDP with the Conservative Party of Canada. The Conservative Party has 20 MPs who are either 40 or younger. That’s right, the Conservative Party has a greater number of young MPs than the NDP has MPs of any age in its entire caucus. The Conservative Party continues to attract youthful candidates to run against the old and tired Liberal and New Democratic Parties. The young professionals in the Conservative caucus represents significant momentum in the party and reflects a greater representation of my generation. I think that the NDP stereotypes young people as naturally contrarian (ie. rebellious adolescents). Most of my peers do have concerns about society, however, their concerns are rooted in whether or not they’ll be able to make a good life for themselves and their families and whether or not their families will be safe in their communities and in the world. We’re a lot more mature than the NDP would wish us to be. CORRECTION: Daveberta has pointed out that I misplaced NDP MP Nathan Cullen who is actually 33. Upgrade that youthful NDP total to 2 MPs. Huzzah!